When I read that Kenneth Branagh is directing and starring in a new movie version of Murder on the Orient Express, I had mixed feelings. I love just about everything Branagh has done--his Dead Again is probably my favorite mystery movie of all time--and seeing him play Poirot is bound to be fun. But the 1974 movie version of Murder on the Orient Express is so delightful that making another one seems unnecessary. It also seems dangerous: Any new version is sure to be compared to the 1974 one, almost sure to suffer by comparison. That got me thinking about movie remakes, wondering if it's possible to draw any tentative generalizations about why some work and some don't. I'm no expert on movies, but it seems to me that some of the best movie remakes are more than remakes: They're independent movies in their own right, genuine reinterpretations of an original text, a character, or a central premise. Other movies (or, in at least one case, television series) aren't remakes but seem shaped by an earlier movie in a fundamental way. They may extend some element of the original movie, or they may challenge it. For lack of a better term, I'll call them replies. And that's my ulterior motive for writing this post. For fear of burying my lede, I'll tell you right now: If you haven't seen a quiet 2012 movie called Liberal Arts, I think you should. 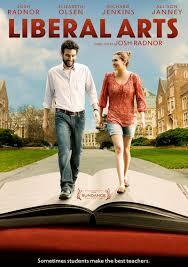 Better yet, re-watch Woody Allen's Manhattan, and then watch Josh Radnor's Liberal Arts. I think Liberal Arts is wonderful, and I think it may represent a truly creative way of responding to a classic movie. More about that later. For now, back to remakes. We often regard them skeptically, partly because there are so many of them: Apparently, 2017 will bring us remakes of everything from The Mummy to Disney's Beauty and the Beast (live action this time) to Death Wish. "Why," we ask, "can't Hollywood come up with something new, instead of recycling the same old plots?" Writers have special reasons for feeling that way. If Kenneth Branagh wants to make a mystery movie, why crank out yet another version of Murder on the Orient Express, when he's more than welcome to the screen rights for our stories and novels? And we've all seen remakes that disappointed us, irritated us, perhaps left us sputtering with disbelief and indignation. (Obviously, the opinions I'm about to express are my own opinions and nothing more. I apologize if they disappoint you, irritate you, or leave you sputtering.) 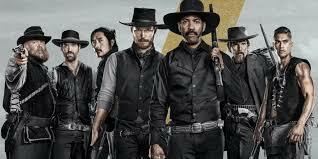 For example, I was looking forward to the 2016 remake of The Magnificent Seven. I enjoyed the 1960 movie and didn't see any reason not to remake it--after all, it's a remake itself, of 1954's Seven Samurai. 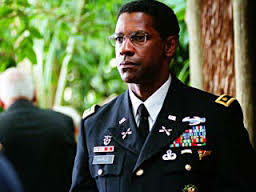 Plus, like just about everyone else, I love Denzel Washington. But the remake left me cold. The cast is more diverse than the 1960 one, the acting is fine, the action scenes are well choreographed (and very long), and some details are educational--who knew pioneer women showed so much decolletage? Aside from that, though, not much about the 2016 version is new. And, at least to me, characterization seems weak. In the 1960 movie, each of the seven becomes a distinct, memorable character, often after only a few minutes of screen time. In the remake, as one after another of the seven fell during the final shootout, I had to keep asking my husband, "Which one was that?" And I found myself wondering why the director decided to remake the movie in the first place, since he didn't seem to have anything new to say. I wondered the same thing when I saw the 2010 remake of 1984's The Karate Kid. (My husband is a fifth-degree black belt, so I have seen every martial arts movie ever made.) The remake takes place in Beijing rather than Los Angeles, and the protagonist is five or six years younger. Other than that, it's almost the same movie. (The director even kept the romantic subplot, so we're treated to the slightly creepy experience of watching two twelve-year-olds kiss. Some additional tweaking of the old script might have been nice.) I'll admit I skipped the remakes of Arthur and The Pink Panther. In each case, I think, the original movie's appeal rests primarily on one actor's remarkable performance, and I doubted the replacement actor could equal it; reviews I've read and comments I've heard confirmed my doubts. I did see the remakes of The Wicker Man and The Haunting, and I wish I hadn't. Remakes that awful feel like insults to the original movies. In general, I think remakes are unlikely to succeed if they feel like no more than attempts to reach a younger audience, promote a promising actor, amp up the special effects, or cash in on a popular movie's name. But we've probably all seen remakes we enjoyed, too. I liked the 1995 remake of Sabrina and the 1978 Heaven Can Wait (a remake of 1941's Here Comes Mr. Jordan). With both, it may have helped that I hadn't seen the original movies first and wasn't tempted to make comparisons--I could simply enjoy the new versions as clever, well-acted movies. After watching the remakes, I made a point of watching the original movies and enjoyed those, too. So maybe that's one thing to be said for remakes: The good ones may attract some new viewers for classic movies. And a pretty good remake my help us more fully appreciate the qualities that make the original movie excellent. For example, I think 1998's A Perfect Murder is a respectable remake of 1954's Dial M for Murder. It borrows key elements (yes, that's a pun) from the original movie but doesn't follow it slavishly. For one thing, the newer movie tries to make the wife a stronger, more independent character--she's highly educated, she has an important job, and she investigates the murder on her own and figures out part of the mystery for herself. She can also be unbelievably gullible, though, and she takes foolish risks that seem inconsistent with her character. And when we compare A Perfect Murder with Dial M for Murder, we see how much has been lost. The humor and the irony are gone. The relationships are less complex, and the characters aren't as subtle and fascinating. (A special note to writers: While preparing to write this post, I re-watched both movies, and it struck me that the characters and relationships in Dial M for Murder are more complex, subtle, and fascinating partly because Hitchcock allows himself two long stretches of dialogue we would today disdain as "info dumps." Yes, it's back story. Yes, the characters are telling and not showing. But it's done well, the back story is engrossing, and telling is probably the only concise way of giving the action a depth it would otherwise lack. Maybe we should reconsider some of the current truisms we all repeat with such confidence.) My guess is that fifty years from now--a safe prediction, since I won't be around to have to admit it if I'm wrong--people will still be watching and enjoying Dial M for Murder, and A Perfect Murder will be, at most, a footnote in books on screen history. It's not a bad movie, though, and if you've got a couple of hours to spare, you might give it a try. Once in a while, a remake may be even better than the original, or at least so good that it's debatable. I'd put the 2004 remake of The Manchurian Candidate in that category. It follows the general outline of the 1962 movie but makes fundamental changes in plot, characters, and theme. It's an interesting movie in its own right, we can see a legitimate reason for returning to the story and reworking it to comment on contemporary situations, and some viewers (including me) think the overall production rises above the impressive original. This time, Denzel Washington found a remake worthy of his talents. 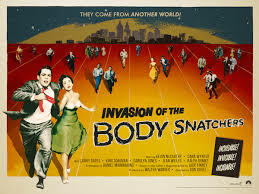 People can also debate the relative merits of the 1956 and 1978 versions of Invasion of the Body Snatchers, and some will stick up for a 2007 remake called The Invasion. The two remakes aren't simply glitzier versions of the original: Each makes major changes in plot and characters, and each develops its own themes. People can debate about the themes, too. Does the 1956 original comment on Cold War tensions, with the pod people representing either soulless Communist infiltrators or followers of Joseph McCarthy bent on suppressing nonconformity? (Each theory has its advocates.) Does the 1978 remake reflect a post-Watergate view of government as riddled with conspiracies? What do we make of all the references to the Iraq war in the 2007 version? The two remakes also offer different ways of resolving a logistical problem the original movie ignores: Once a pod person takes over a human's mind, what happens to the human's body? All three of these movies, as you may know, are adaptations of Jack Finney's 1954 science fiction novel, The Body Snatchers. So should the two later versions be seen as remakes of the original movie, or as reinterpretations of Finney's novel? I can't answer that question--I don't know if the people who made the later movies even read the novel--but I do think some movies often called remakes might more aptly be called reinterpretations. For example, there's the 2010 True Grit. Like its 1969 predecessor, the 2010 movie is based on a 1968 Charles Portis novel of the same name. I haven't read True Grit, but all the reviews and articles I've seen agree the second movie follows the novel more closely than the first one with regard to plot, characters, tone, and other elements. And Joel and Ethan Coen, who wrote, directed, and produced the 2010 movie, have said they decided to make it because they were intrigued by the book and particularly by the voice of its narrator, Mattie. In this case, then, "reinterpretation" may be more accurate than "remake." That may also be the term to use when talking about the many movie versions of the Sherlock Holmes novels and stories, of other novels and stories, of plays by Shakespeare and others, of legends such as the story of Robin Hood, and so on. It's probably helpful to see most of these as reinterpretations of the original source, more than as remakes of earlier movies. That's what I hope Branagh's Murder on the Orient Express will be--a fresh interpretation of Agatha Christie's novel, not just an attempt to duplicate the success of the 1974 movie. After all, there have been several film versions of Ten Little Indians / And Then There Were None. 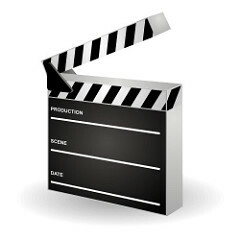 When a story's so gripping, it's no wonder many moviemakers want to take a turn at telling it. 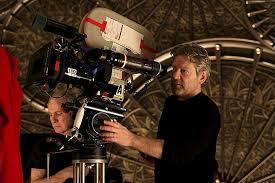 Branagh still faces a daunting challenge, since the 1974 movie was so good. It's almost like attempting another movie version of The Godfather or To Kill a Mockingbird--probably not a smart move. (People are welcome to keep making movie versions of Pride and Prejudice, though, until somebody finally gets it right. In my opinion--and again, it's merely an opinion--the only movie that does Jane Austen justice is Emma Thompson's Sense and Sensibility. It still breaks my heart that Thompson and Branagh got divorced.) Anyway, I wish Kenneth Branagh well with his reinterpretation. I can't think of anyone more likely to succeed at the task he's taken on. Liberal Arts centers on the attraction between thirty-five-year-old Jesse and nineteen-year-old Zibby. (Sound familiar?) Jesse's a bookish, discontented admissions counselor at a New York City college. He goes back to Kenyon for a favorite professor's retirement dinner and meets Zibby, a sophomore. They strike up a friendship. The next day, they take a long walk around campus, talking about books, music, life. After he returns to New York, they write to each other, and the friendship deepens. She invites him to come back to campus to visit her. When he does, she says she wants to have a sexual relationship with him. I'll stop the plot summary there, both for fear of spoiling the movie for you and in hopes of enticing you to see it. Instead, I'll mention a few similarities and differences between Liberal Arts and Manhattan--I assume you've all seen Manhattan, so I won't worry about spoiling that. Manhattan is set entirely in--well, Manhattan; Liberal Arts balances New York scenes against scenes set in the nearly pastoral village of Gambier, Ohio. In both movies, the age difference between the man and the woman is considerable, but Manhattan's Isaac is forty-two, and Tracy is seventeen--a significantly larger difference, especially since Tracy's still in high school and below the legal age of consent. Isaac's fiercely solipsistic, almost exclusively focused on his own problems and needs. He cites concern for Tracy's welfare as his reason for breaking up with her, but is his attraction to another woman his real motive? When his relationship with the other woman ends, and a depressed Isaac realizes "Tracy's face" is one of the things that makes his life worth living, he tries to persuade her to come back to him, even though she's about to embark on a journey that could enrich her life. Jesse, like Isaac, spends time fretting about his needs and disappointments. But he clearly cares about other people, too, including Dean, a brilliant but troubled student Jesse meets during his first trip back to Kenyon. When Dean's life comes to a crisis, Jesse rushes to the college again to help him through. And when eminently desirable Zibby invites Jesse into her bed, he responds with sentiments seldom expressed in movies these days. "I believe in consequences," he says. "No, you believe in guilt," she counters. "Maybe," he admits. "But guilt before we act is called morality." Well, that's probably a spoiler. But it's one of my primary reasons for thinking Liberal Arts is a reply to Manhattan. Both movies are well-written, well-acted, visually stunning, deliciously witty. Both center on similar situations. But the protagonist in Manhattan is ruled by his desires, and the protagonist in Liberal Arts can put his desires aside and make careful moral choices--again, something we seldom encounter in movies these days. 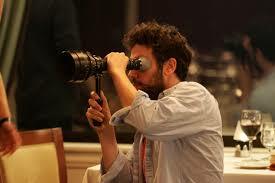 Does Josh Radnor see Liberal Arts as a reply to Manhattan? Did he ever even see Woody Allen's movie? I don't know. If he didn't, it's a remarkable coincidence--the kind of coincidence any good mystery writer rejects as unbelievable. When I was a freshman at Kenyon College, taking a year-long survey course in the history of British literature, I was often struck by the way the writers we studied seemed to be carrying on a dialogue with each other, a dialogue stretching across centuries. Writers alluded to their predecessors, imitated them, rebelled against them, borrowed from them, reshaped what they borrowed. It's natural for writers to influence each other and try to outdo each other. Moviemakers seem to be engaged in a dialogue with their predecessors, too. At this point, the dialogue often takes the form of remakes. As time goes on, the dialogue may become more varied, as writers and directors discover new ways to respond to movies that inspire or provoke them. In the meantime, we viewers wade through many remakes, avoiding or enduring the mediocre ones, surprised by joy when an old favorite gets transformed into a new delight. Are there movie remakes or reinterpretations you especially like or dislike? Are there movies you see as replies to earlier ones? If I've maligned a movie you love or praised one you despise, please don't hesitate to say so. People get passionate about movies--that's one thing that makes talking about them so much fun. And I'm sure we'll all be nice to each other. 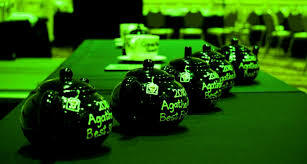 As others have already noted, three SleuthSayers have been nominated for the Best Short Story Agatha this year--Barb Goffman, Art Taylor, and me. Gretchen Archer and Edith Maxwell have been nominated, too. I'm thrilled and honored to be named along with these fine writers. You can read all the nominated stories here. Best of luck with the Agatha! Count me as someone who much prefers the original lovely black and white version of the Invasion of the Body Snatchers even if the acting is only mediocre. California looks like paradise in it! Great post, B.K. And you've really given us a lot to chew on. More than often than not I probably prefer the original to remakes, but that's because it's what I know, what I'm used to and what I expect. But also because I think in many remakes they go more for sensationalism than craft. You mention The Haunting. The original of that is a truly haunting and scary movie, but very subtle. The remake is a loud, ludicrous piece of garbage. And worst of all stupid, but not scary, at least to me. And while the original Invasion of the Body Snatchers is tied for my fave sci-movie (with Forbidden Planet) and I didn't at all like the Donald Sutherland remake when I first saw it it's grown on me over the years to where I can enjoy it in its own right. I think sometimes it's good to bring a great movie to a new generation. Unfortunately the newer version often doesn't stack up and I wish younger people would watch the originals. I guess some do, but many don't. That should have been "sci-fi" movie, above. BK, Oh! How appalling it is, when Hollywood remakes something that destroys the magic of an earlier version! The Hitchhiker's Guide to the Galaxy movie by Hollywood is my particular gripe. BBC did an absolutely wonderful TV series (long ago) that perfectly carried over the wacky humour of the book. Hollywood's version is clunky,stodgy, without the breezy and brilliant wit that characterizes the book. A travesty! Congrats on the Agatha! I'll be clapping from Canada. Melodie, I entirely agree about the BBC series version of Hitchhiker's Guide to the Galaxy, and I HATED the Hollywood remake. On the other hand, before we bash all remakes, let us never, ever forget that the Bogart "Maltese Falcon" was a remake - the first version was done in 1931, and no one remembers it. And I thought BOTH versions of "Cape Fear" - 1962 and 1991 - were pretty damn good. Thanks, Janice and Paul. It would be hard for me to say which version of Body Snatchers I prefer. I have a sentimental preference for the original, but I think the 1978 remake is a well-done, scary movie, too, and I even like the 2007 version, which most critics despise. Among other things, it's interesting to see the changes in the way psychiatry is portrayed: The psychiatrist in the first two versions spout some psycho-babble to explain the my-husband-is-not-my-husband phenomenon, while Nicole Kidman just gives her patients more pills. Here are some interesting tidbits I came across while reading up on the movies: Kevin McCarthy, who starred in the original, makes a cameo appearance in the 1978 version, as the panicked man who runs into the street and tries to stop Donald Sutherland's car; and Veronica Cartwright, who played Nancy in 1978, has a small role as Nicole Kidman's first panicky patient. And Paul, I couldn't agree more about The Haunting: Scenes that are quietly terrifying in the original come across as silly in the remake. 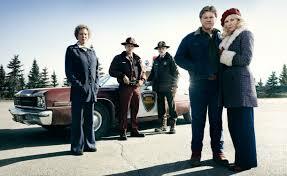 I was nervous about the Fargo TV series before it started. I had a hard time believing it could live up to the movie. But the TV show is wonderful. And, amazingly, season two was even better than season one, which is so unusual (especially since season one was great). One thing about the show, at times it's a direct take-off on the movie. For instance, in season one, a character finds a suitcase filled with money--the very suitcase that Steve Buscemi's character buried in the movie. And at the end of the movie, Frances McDormand's sheriff character Marge talks to one of the bad guys about what he's done (in dialogue I've practically memorized), "And for what? A little bit of money? There's more to life than a little money, you know. Don'tcha know that? And here ya are, and it's a beautiful day. Well, I just don't understand it." And then, in season one, Allison Tolman's Molly says something extremely similar when talking with a bad guy in the hospital. These little touches make the show that much better. LOVE FARGO! Can't wait for season three to start sometime later this year. And congratulations again on your Agatha nomination! Looking forward to Malice Domestic in the spring. Melodie, I'll admit I've never seen either version of Hitchhiker's Guide, but now I'll make a point of doing so, and I'll be sure to look for the BBC version, not the Hollywood one. 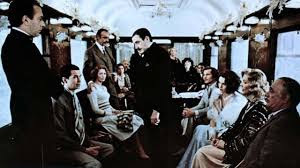 Eve, I can see your point about the 1974 Orient Express, but the individual segments were so well done that I enjoyed them anyway, and I thought Albert Finney was over the top but completely entertaining as Poirot. Barb, I noticed those references to the movie in the first season of Fargo, and I loved them (especially the suitcase--it was always fun to speculate about what might have happened to that suitcase). I'm looking forward to the third season, too--but, as always, with a little bit of apprehension, nervous that this one might be a letdown. Thanks, everyone, for the kind words about the Agatha nomination. Good luck to my fellow nominees, too! Bonnie, I prefer the original to the remakes. I find myself constantly making comparisons between them and then being disappointed. The original Magnificent Seven was much better, in my mind, but I didn't know for years that it was a remake of The Seven Samurai which I saw decades later and also enjoyed even with comparisons. As for Fargo, I loved the movie and kept looking for comparisons with the TV series, but by the second season, the TV series came into its own and was terrific. Incidentally, I worked eastern South Dakota, and even though the series claimed that events were based on true happenings, the great motel shootout did not happen in Sioux Falls. Darn, would have made the story more real if it had. Must be one of those examples of alternative facts. 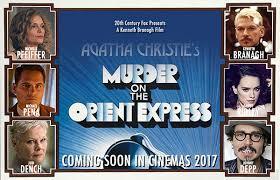 It occurs to me that Branagh's Orient Express is going to be the fourth version in the forty-odd years since Lumet's. That's not a record, to be sure: Huston's Maltese Falcon was the third pass in less than a decade; others among you can come up with examples of your own. Still, it seems to me that if Branagh is all that hot to do Poirot, Agatha Christie wrote a whole lot of other stories that haven't even been filmed once (save for the Suchet series, of course). I'll spare you all my standard rant on the subject of Demographics, the Junk Science of our lifetime, and the reason that no one wants to do anything different than what everybody else is doing. I loved this post, Bonnie. I've seen all the movies you mentioned except Liberal Arts. Like R.T. and others, I usually prefer the originals--especially The Magnificent Seven, The Flight of the Phoenix, The Time Machine, The Longest Yard, The Thomas Crown Affair, The Fog, The Taking of Pelham 123, The Getaway, The Stepford Wives, and so on) and I'm especially fond of all the original TV series that spawned ill-advised remakes (The Man From U.N.C.L.E., The Lone Ranger, etc.). Some movie remakes that I thought turned out better than the original films were 3:10 to Yuma, The Thing, True Grit, Heaven Can Wait, You've Got Mail, Ocean's Eleven, and Assault on Precinct 13). You never know. And congrats again on the Agatha nomination!! No matter how good or even bad a remake/reinterpretation/revision of an earlier movie might be, I still think if an old movie was great, why redo it. If it was lousy in the first place, why redo it. As a writer I resent other writers "borrowing" a plot and its characters from a fairly recent movie and claiming it as their own. Shakespeare and a few others have been around for a long time and doing a new version of their work doesn't fall into that category. West Side Story was Romeo and Juliet set to music. But redoing a classic for the sensibilities of a younger audience is a poor excuse. Write a new classic. If the writers today can't do that, work as a greeter in K-Mart. Leave the good stuff alone. R.T.,like you and John,I usually prefer the originals, with rare exceptions such as True Grit and The Manchurian Candidate. I avoided the Fargo television series for a long time, for fear it would be a disservice to the movie, but I kept hearing such good things that I tried it and was blown away. As for Sioux Falls, I lived there for eleven years (amazing how many SleuthSayers have South Dakota connections)--we had a couple of bank robberies while I was there, but no shootouts. That's a deal, Bonnie! Our friend Deborah Elliott-Upton put me onto TWD, and it turned out far better than I thought it would. Thanks for the tip, on Liberal Arts. John, I'm keeping my end of the bargain--I've put Season One in my Netflix queue. Good grief. With my luck, my husband will love it and make me watch every episode. Gayle, I agree with you 99%--most remakes are uninspired and unnecessary. Once in a while, though, there's one that's worth seeing. I do agree that we need more truly original movies and fewer retreads.
" ... younger audiences who don't want to watch a movie that's more than a few years old ..."
See, when I was younger (longer ago than I want to admit), the only movies that you could see were "more than a few years old". That was what I found most interesting about them - especially when I could see the connections between them and the newer things I was seeing at the same time. TV in the '50s (and the old movies that made up so much of the schedule) was a smorgasbord of history, with as many connections as you could find, if you were willing to look. To this day, I just can't comprehend why anyone wouldn't want to watch something just because it's in black-and-white, or was made before they were born, or had a cast that mainly wasn't alive any more, or any of that. All that applied to much of what I saw as a kid (I slightly predate color TV), and Demographics weren't around to tell me what was "too outdated" for me to appreciate. Up to now I thought it was that today's youth didn't have a sense of history. Now I'm thinking it's a loss of curiosity. Mike, it sounds as if you and I grew up around the same time. Our family had only one television set, and it got only four channels (five when conditions were just right, and we could pick up a Canadian channel, too). So I spent a lot of time watching television with my parents, seeing the shows they wanted to see. I think that experience broadened my tastes--I didn't have the luxury of always being able to watch things that already fit my interests, so I developed new interests. My parents probably did, too, when I was desperate to see the Beatles on Ed Sullivan and persuaded them to do without Bonanza for one week. Now, most families have two or more sets, there are channels to cater to every taste, and parents and children watch separate shows in separate rooms. It's wonderful to have so many choices, but I think something has been lost, too. Great post here, Bonnie. I've been at a conference since mid-week, so just catching up on things, but very much enjoyed--particularly your comments about how creators are in dialogue with one another, such a good point. I've long considered Manhattan one of my favorite movies (has been since I first saw it), though I haven't seen it in a while. I skimmed through some of your comments about Liberal Arts because I want to see if myself first. Appreciate you bringing it to our attention! Great post, BK! I thought that the movie Liberal Arts was one of the most thoughtful and nuanced movies I've ever seen, and thinking of it as a reply to Manhattan makes me like it even more. (I always found Manhattan so creepy and terrible.) I will admit though that I have never seen any version of the Orient Express! I may have to watch one now, since you seemed to think of it so highly. Congrats on your well-deserved Agatha nomination! I'm glad you enjoyed the post, Miriam. I agree (obviously) about Liberal Arts. The first time I saw it, I was stunned--I can't remember the last time I saw a movie that took moral choices so seriously (and yet managed to be delightfully funny at the same time). The 1974 Murder on the Orient Express is a different sort of movie. It doesn't leave you pondering serious issues, just entertains you with two hours of pure fun, highlighted by Finney's outrageously energetic performance as Poirot. I think you'll enjoy it. Do You Do Artist Dates?